Chris Olsen isa personal injury attorney who fights to ensure that clients receive the damages they are due when they have been injured as the result of another party’s negligence. One common source of personal injury is automobile accidents. 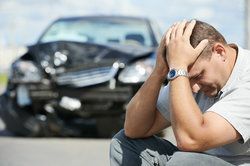 While most people think of automobile accidents as involving two or more vehicles, single vehicle auto accidents are also a very common occurrences. Mr. Olsen understands the varying causes of single vehicle auto accidents and can help determine the rights of his San Diego clients who have been involved in single auto accidents. Driver negligence: Driver negligence is one of the leading causes of single vehicle accidents. Negligent behavior while driving includes a wide range of unsafe driving practices including speeding, texting or talking on the phone while driving, falling asleep at the wheel, and driving while under the influence of drugs or alcohol. Collision with another object: In many cases, a single vehicle crash is the result of a collision with another object. This may include a stationary object such as a guardrail or tree, or a moving object that has fallen off the back of another vehicle. Road conditions: Poor road conditions as the result of poor maintenance or poor road conditions as the result of weather (such as rain, snow, ice, or fog) are often contributing factors in single vehicle accidents. Mechanical defect or failure: If a car part becomes defective or fails to function, it will likely result in an accident, and is a common cause of single vehicle accidents. Examples of mechanical defects include problems with brakes, tires, or steering. Mr. Olsen is an experienced car accident attorney who is able to determine when compensation is due to his clients. Driver negligence is the most common cause of single vehicle accidents. If you or a loved one was a passenger in a vehicle involved in a single vehicle auto accident that was the result of driver negligence, you can likely collect damages based on injuries or emotional damage that was sustained. Although the instinctive assumption is that the driver is at fault in a single vehicle accident, that is not always the case. Negligence may also be found in accidents that have been caused by unsafe road conditions, the actions of another driver, or mechanical defects or failures. In these cases, compensation may be due. If you have been involved in a single vehicle auto accident and are interested in learning your rights, time is of the essence. Contact us at your earliest convenience to schedule your free consultation. Chris Olsen will investigate the details of the accident and work on reaching a fair resolution.